It's hard to go wrong with "dinner and a movie," but every now and then, it's nice to try something new and different. 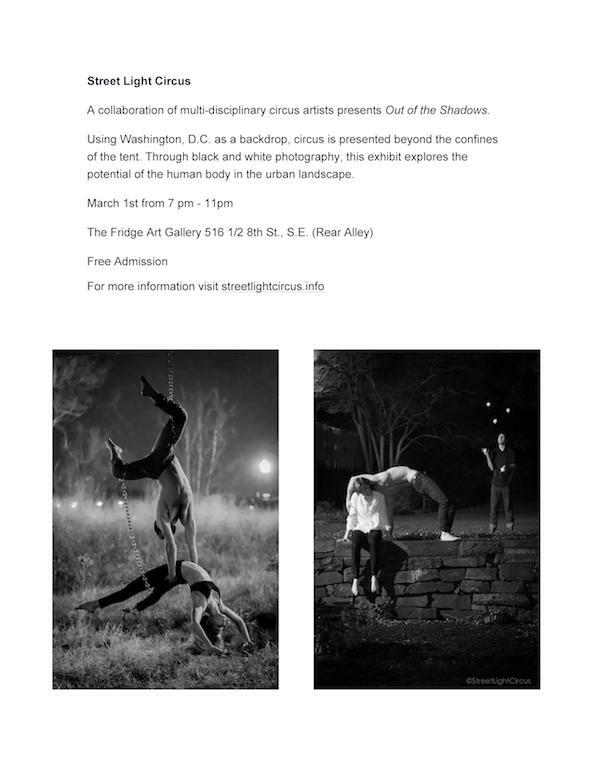 Street Light Circus is presenting a free art exhibit titled 'Out of the Shadows,' Tuesday, March 1st at The Fridge Art Gallery in Barracks Row. It starts at 7:00 PM and runs through 11... allowing you plenty of time to grab a bite-to-eat across the street at our 2015 Restaurant of the Year (Ambar) or most everyone else's favorite (Rose's Luxury.) The exhibit features photos of (and created by) a most-interesting quartet (an acrobat, aerialist, juggler and photographer.) To learn more, take a peak at their official press release below; and don't forget... Admission is FREE!